In 1924 Paul Victorius left his home in New York City to study medicine in London. 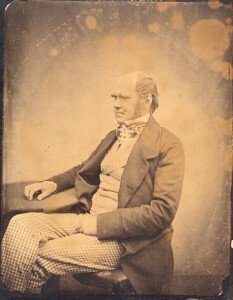 As he pursued a medical degree he began collecting rare books and manuscripts, focusing primarily on material concerning Charles Darwin and the theory of evolution. After two years, Victorius dropped his medical studies and opened his first bookshop, selling books mainly to finance his growing evolution collection. His London bookshop was destroyed early in World War II, and in 1940 Mr. Victorius returned to the United States, eventually settling in Charlottesville, Virginia. By this time, his collection had grown to become reputedly the largest and finest in the world, with the exception of the one owned by Charles Darwin himself. After setting up shop in Charlottesville, Mr. Victorius began buying and selling fine prints and antiquarian maps (it was he who sold to the University of Virginia one of two known copies of the first printing of the Fry Jefferson Map, 1751). He also founded a picture-framing business that still operates on University Avenue today. In 1949 Mr. Victorius made a partial gift of his entire collection of Darwin-related material to the University of Virginia Library; the remainder of his collection was purchased with funds from an anonymous donor. Among the manuscript material are two watercolors of the H.M.S. Beagle by Conrad Martens, Darwin’s queries on human expression, a ticket and program for Darwin’s funeral, portraits of Darwin and his family, and over one hundred letters relating to Charles Darwin and his contemporaries, and to the discoveries of and theories about evolution. A complete list of the manuscripts is available online. The volumes in the Victorius Evolution Collection have been cataloged and records are available in the Library’s online catalog, VIRGO. Search for victorious evolution collection. Select Special Collections as the library from the left column in the search results.